After meeting your guide, enjoy some Starbucks coffee and snacks (not included) and off you go in an off road equipped hot air balloon "chase vehicle" to a launch location predicted my mother nature. You than are able to take in the the beauty of the Sonoran Desert sunrise while the beautiful hot air balloon is inflated and prepared for launch. Into the wild blue you will fly for approximately an hour. During this time, you will hear about the flora, fauna and wildlife of the area as well as the history. After landing your guide will pull out the picnic baskets and tables for your traditional champagne toast and gourmet breakfast of hors d'oeuvres as the forefathers have done since 1783. 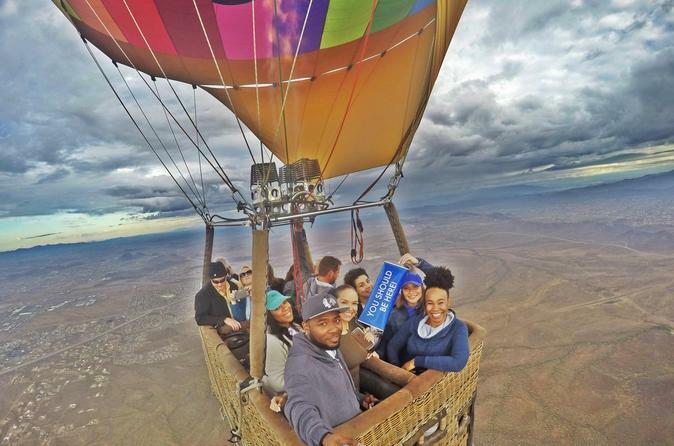 Once the crew has packed up the balloon and you have enjoyed sipping on champagne, you will be brought safely back to your meeting location for a chance to sit and share the adventure of having become one with nature in the sky.